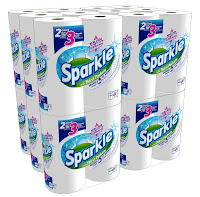 Amazon has a great deal on Sparkle Paper Towels Giant Rolls (24 ct.) for $23.91. Plus then is a $1.00 off coupon, making them $22.91. That's $0.95 a Giant Roll! This is an amazing stock up price! This item is eligible for FREE shipping on orders over $25. Sparkle 2-ply Paper Towels come in white and decorative prints to brighten up your house. Best of all, they're priced just right. So, you won't be wasting money you can spend on something more fun than paper towels. Be clean enough to be healthy and messy enough to be happy.